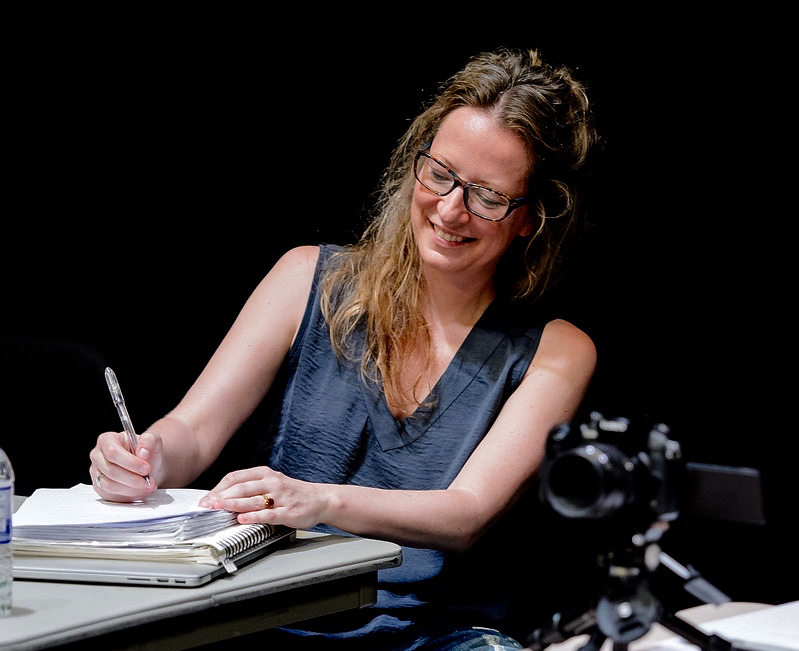 composer-director Amy Beth Kirsten’s musical and conceptual language is characterized by an abiding interest in exploring theatrical elements of creation, performance, and presentation. Her body of work fuses music, language, voice, and theatre and often considers musicians’ instruments, bodies, and voices as equal vehicles of expression. Ms. Kirsten has written and composed fully-staged theatrical works as well as traditional concert works for her own ensemble, HOWL, musicians from the Chicago Symphony Orchestra, the New World Symphony, Peak Performances, the multi-Grammy-winning eighth blackbird, American Composers Orchestra, and many others. Ms. Kirsten begins the 2018-19 season composing solo and chamber works for Mike Compitello (percussion), the Dutch singer/composer Bec Plexus (voice and percussion), New Thread Quartet (saxophones), and Don Berman (piano). Late in the season HOWL's designers join Ms. Kirsten to develop an evening-length music-driven theatrical work, Jacob in Chains, commissioned, produced, and performed by Alarm Will Sound. World premiere performances in 2017 of Ms. Kirsten's 90-minute QUIXOTE were the culmination of a 2-year artist residency at Montclair State University (NJ) with HOWL. A theatrical work inspired by Cervantes’ epic novel and performed by vocal trio, singing percussion quartet, and actor/director, Mark DeChiazza, it was described as “wildly inventive” by the New York Times. Ms. Kirsten made her Carnegie Hall debut in 2014 with strange pilgrims, a concert work for chorus, orchestra, and film commissioned by the American Composers Orchestra. That season she was also the inaugural Composer-in-Residence for London’s Riot Ensemble who commissioned she is a myth and gave the U.K. premieres of several of her chamber works. Guest lectures have included those at Royal Northern College of Music in Manchester (U.K.), Yale University, Princeton University, Curtis Institute, Cornell University, and the Royal Academy of Music in London. Ms. Kirsten grew up in the suburbs of Kansas City and Chicago and was educated at Roosevelt University (MM) and the Peabody Institute (DMA). After living for seven years in Baltimore she now lives with her husband, Christopher Theofanidis (also a composer), in New Haven, Connecticut and teaches music composition privately and, for the past eight years, at the HighSCORE summer festival in Pavia, Italy. She served on the faculty of the Peabody Institute of the Johns Hopkins University during the 2015-17 academic years before joining the Composition Faculty at Longy School of Music of Bard College in the Fall of 2017. Alarm Will Sound (2018), New Thread Quartet/Chamber Music America (2018), Michael Compitello, solo percussion (2018), Bec Plexus, voice and percussion duo (2018), Donald Berman, piano (2018), Chicago Symphony Orchestra (2017, an evening-length chamber theatre work celebrating 20th anniversary of MusicNOW), Riot Ensemble, U.K. (2017), New World Symphony (2016, a 15-minute chamber theatre work for strings and actors), Peak Performances for HOWL (2015-17), Volti (2015), HOWL (2015), Nadia Spachenko, piano (2015), Jasmine Hogan, harp (2015), Riot Ensemble, U.K. (2014), American Composers Orchestra (2014, for chorus, orchestra, film), Kristin Elgersma, piano (2014), eighth blackbird (2013), Pittsburgh Symphony Orchestra (2013, libretto by Amy Beth Kirsten / music by Chris Theofanidis), TwoSense/Fromm Foundation (2012), the Calyx Piano Trio/Chamber Music America (2012), Tim Munro, flute (2011), Vicki Ray, piano (2009), Jamestown University Wind Ensemble (2009), Dark in the Song bassoon collective (2010), Lindsay Kesselman, soprano (2012), Robin Kesselman, contrabass (2012), Emerging Voices Project, alto saxophone and soprano (2011), and Missouri Verses and Voices (2010). These commissions have been funded by the Virginia B. Toulmin Foundation, Arts Council England, the Presser Foundation, Museum of Contemporary Art (Chicago), the MAP Fund, The National Endowment for the Arts, the Fromm Foundation at Harvard University, University of Richmond, the Leonard Bernstein Family, ASCAP Foundation, Chamber Music America, Piano Spheres, California Institute for the Arts, New Music USA Composer Assistance Grant, Elizabeth Liebman, the Walters Art Museum (Baltimore), the State of Connecticut, and YOU via Kickstarter.